When Aroldis Chapman was clocked at 105 mph during a minor league game, scouts around the game and in the media responded with skepticism, even though the eye popping number was reportedly recorded on two different radar guns. Well, in last night’s relief appearance against the Brewers, Chapman repeatedly threw fastballs that registered over 100 mph, including two that topped out at 104 mph, according to PitchFX. Where are all those doubters now? 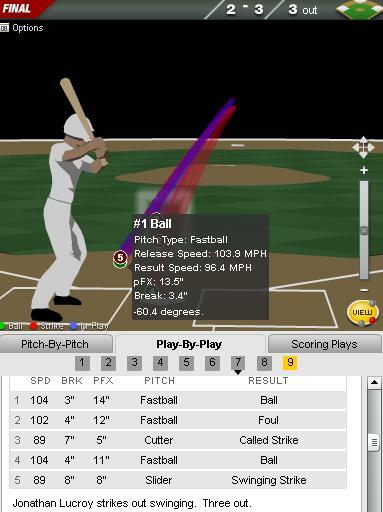 Aroldis Chapman's first pitch to Jonathan Lucroy was recorded at 103.9mph. Chapman threw another pitch clocked at 103.8mph in the AB before striking Lucroy out on a slider. Although still short of the elusive 105 mph that had so many shaking their heads, Chapman’s fastball is everything it was reported to be and more, making the Reds off season acquisition look even more incredible. If Chapman is able to harness his blazing fastball, not to mention his sharp breaking slider, he may turn out to be the once in a generation talent that everyone thought Stephen Strasburg was going to be. Unlike the 2009 number one draft pick, however, Chapman was available to the highest bidder, which means there are 29 other teams who may wind up regretting their relative lack of interest in the Cuban defector who has already drawn comparisons to Randy Johnson. If Chapman turns out to be anything like the Big Unit, it could be a Reds October for years to come.